Video proves the pitch was a strike. the decisive pitch was located knee high and over the inner half of home plate (sz_bot 1.570, pz 1.640; px 0.246) while the other called strike during at bat—strike one—was located belt high and over the inner half of home plate (pz 2.022; px 0.455); strike two was a foul ball, the entire at-bat was officiated properly and the call was correct. At the time of the ejection, the Yankees were leading, 4-3. The White Sox ultimately won the contest, 6-5, in 12 innings. This is Greg Gibson (53)'s first ejection of 2013. Crew Chief Jerry Layne now has 6 points in the UEFL's Crew Division (5 + 1 Correct Call = 6). This is the 120th ejection of the 2013 MLB season. This is the White Sox's 3rd ejection of 2013, T-3rd in the AL Central (CLE, DET 5; CWS, KC 3; MIN 2). This is Don Cooper's 1st ejection of 2013 and first since April 16, 2012 (Lance Barrett; QOC = Incorrect). This is Greg Gibson's first ejection since June 10, 2012 (Jim Tracy; QOC = Incorrect). I'm starting to think it was a really good thing UEFL adopted the rule about correcting the MLB box score when the official scorer makes an "obvious error." I'd say giving the wrong team the win would qualify as an "obvious error." SELIG! Time to hire scorers who stay awake through the END of the game. Great pitch and great call. 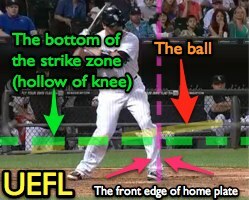 Painted the bottom of the zone - came in really at the top of the knee, definitely a strike out pitch and well executed. You guys love to concentrate on the previous pitch and give credit for something that may have actually had very little to do with the play. Considering the pitching coach is yelling something about being brutal all day....I'd guess he's referring to the overall game that Gibby has called....not the one knee pitch he just zipped his guy with in the 8th inning. That ejection wreaks of a pitching coach fed up with his guys getting squeezed at the knee all night then all of a sudden he decides to call it on his guy around the same spot he hasnt five them all night. He pops off, Gibby pops back, then he says ok I wanna go now. I have no idea who was right or wrong...but maybe if the league based judgement on the overall game when it came to an ejection like this one...it might be more acurately scored. Or more accurately, in YOUR zeal to take credit away from the umpire for a correct call, you're bringing in a straw man argument to make the ump look bad. News for you buddy, Gibson was pretty consistent this game and, oh yeah, the call here was right of course. Three - Logical conclusion = the call was right! I'd see that's pretty accurately scored. Dude, put up or shut up. Nearly every pitch located on the low boundary thrown during this game was called in favor of Chicago - that's a +3 borderline low strike swing favoring Chicago. If anyone was getting the shaft this game, it was New York by a thin margin. That's what happens when people have to listen to the hawk every game. They blame the umpire for every loss. Wil Little ejected Max Scherzer from the Tigers bench tonight in New York. Brewers manager tossed by Bellino over fan interference.